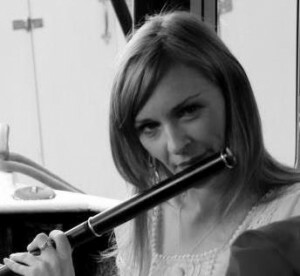 Katherine Macleod is a Scottish musician from East Kilbride, Scotland She plays many instruments but her main talents are in flute, whistle and singing. She has been interested in music from an early age, and started singing in the East Kilbride Gaelic choir, aged nine. She competed in the Gaelic Royal National Mod competitions for many years with the East Kilbride Junior Gaelic choir and in solo competitions winning several medals and trophies. Katherine has played music in all genres including Classical, Jazz, Blues, Arabic music and Indie/rock. Her main passion has always been traditional music and she taught herself whistle as a teenager before further developing her skills on silver flute and Irish blackwood flute. She started playing and singing in the Glasgow music scene in her late teens and has performed at most of the top venues around Scotland, including the Royal Concert Hall, S.E.C.C as well as regular appearances at large music festivals in Scotland such as Celtic Connections and T in the Park. Katherine has also toured extensively in Europe and also performs regularly in Dubai and Qatar. Currently Katherine Macleod is enjoying performing with several bands. She is a founding member of all girl band, Celtic Quines who are regulars on the Scottish folk club scene as well as being popular in Robert Burns societies. She is also a member of the John Carmichael Ceilidh band who are very busy on the Scottish ceilidh scene and regularly perform for the British Royal Family. She plays in a Scottish four piece folk group called Skirlie. Katherine has also been playing with the Assassenachs over the past four or five years and enjoys playing with them in Scottish, European and Scandanavian locations. She teaches within a few different organisations and enjoys teaching immensely. Katherine is currently teaching Whistle and Mixed Instrument at Glasgow Fiddle Workshop which she takes great pleasure in. She also works with children at Feisean nan Gaidheal in the Highlands and Western Isles, teaching whistle, flute and Gaelic singing and is passionate about passing on the traditions to the younger generation.